Chili Pepper Ornamental Filius Blue Capsicum Annuum is a very popular, ornamental chili pepper. Chili Pepper seeds can be started indoors, and also called Christmas Peppers, the Capsicum Annuum Filius Blue is a unique bushy and compact variety that produces small, oval-shaped blue fruits that change their color to red as they mature. The masses of very showy fruits cover the entire plant and create a stunning display of color in a garden. 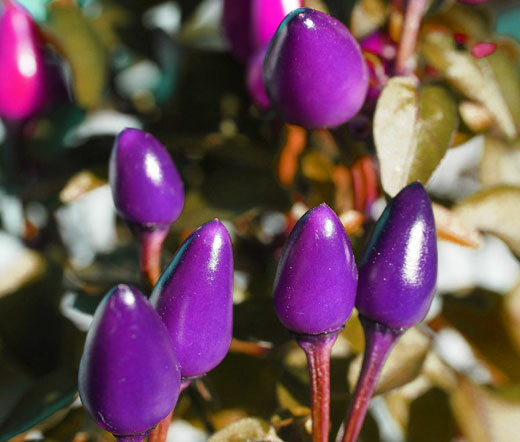 Chili Pepper Ornamental Filius Blue is perfect for ornamental landscaping or for growing in pots. Capsicum Annuum seeds have to be planted not deeper than 1/16 inch, and Ornamental Chili Pepper is a very popular house plant that is often planted in August for growing as a Christmas gift. Capsicum Annuum likes to grow in full sun and requires moderate watering. The fruits of Ornamental Chili Pepper are edible with a very hot flavor when young, but the fruits become become milder when their color turns red.